A still from The Fall. Tarsem Singh Dhandwar is on the top of his game, with several hit music videos, a very successful and lucrative career in directing commercials and two films, which have polarised critics and earned him countless fans. But just don't call him Mr Dhandwar or Mr Singh! "My name is Tarsem," says the filmmaker who created the brilliant music video for R.E.M.s' Losing My Religion. 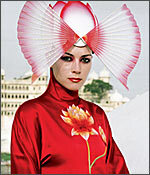 "My friends always call me Tarsem." When he was making his first feature -- The Cell, with Jennifer Lopez [Images], Vince Vaughn [Images] and Vincent D'Onofrio, the studio insisted that he should have a first and a last name. So he decided to use his middle name -- Singh, as his last name. "But then everyone started calling me Mr Singh and I wouldn't turn around, because I didn't know who they were talking to," he adds. "My dad was called Mr Singh in Iran. There are millions of people in India who are called by that name. So I kept my first name. I wouldn't change it to a western name, because my name is still functional enough." Last week Tarsem's visually stunning film The Fall opened in a few theatres in the US. And some critics could not figure out how to assess the film which is very strong on style, cinematography and production design, and rich in imagination. "There is a particular pill that I ask people to take," he says, "and if they don't find it, they cannot get into the film and hate it with a passion. And I guess that is a great place to be in." The Fall is based on a Bulgarian film Yo Ho Ho. Tarsem bought the rights to the film, but barely saw it again. Instead he built a hallucinatory story about an injured stuntman (Lee Pace of ABC's Pushing Daisies) in a hospital in Los Angeles (the hospital scenes were actually shot in South Africa), who narrates a fabulous story to a young girl (played by a delightful Romanian non-actor Catinca Untaru). The film is a fantasy and a story-within-a-story, and so we meet with an assorted mix of characters, including Alexander the Great, and Charles Darwin and his monkey in search of an elusive butterfly. Tarsem broke one of Hollywood's cardinal rules and self financed The Fall, knowing that no one in the industry would buy his dream of travels to over 20 countries and sumptuous exotic locations. "The film could take two years, or four years or 10," he says. "I had no idea. So I knew I had to think outside the box." It took him nearly 16 years to complete the film and he had the support of his fellow filmmakers and music video directors David Fincher (Seven, Zodiac) and Spike Jonze (Being John Malkovich). The two are listed as "presenting" the film. The most impressive segments of The Fall are the sequences in India -- Agra [Images], Udaipur, Jodhpur, and other parts of Rajasthan. India has never looked so beautiful on screen. "People who have never been to India assume this is how these places look like and that Hindi films must have the same look," Tarsem says. "And I say no, Hindi movies often do not capture the beauty of India. They may show the same places, but I look at them with a different eye." 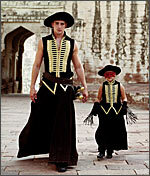 Since colours play an important role in The Fall and Tarsem's other works, observers note that perhaps it is the influence of Bollywood. "I left India when I was 24," says the filmmaker. "I used to watch every Hindi movie until the late 1970s, when I was in college and I absolutely loved them." "My work is kind of splashy with colors and extravagant, and people may think it comes from my Bollywood background," he adds. "But then everything comes from your background. Bollywood movies throw in a lot of colour without much thought. But even with messy colours they have their own charm, like in Disco Dancer -- a very kitsch film. But these are not the kind of films I like to make. I believe that if you are going to put in any colour, you should put it in the right place." Now 47, he has only seen one Bollywood film in the last two decades. "It was the cricket one, because I met the actor and I liked him," he says referring to Lagaan [Images] and Aamir Khan [Images]. "It was Seven Samurai with 11 cricketers." 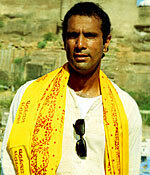 Son of an engineer who was posted in Iran, Tarsem attended the Bishop Cotton School in Shimla. He later studied B.Com at Hans Raj College at Delhi University. He wanted to study filmmaking in the US, but convincing his father was a difficult job. He took the GMAT tests and came to the US under the pretext of attending a business school. Instead he joined a two year filmmaking course at a community college in Los Angeles. And he later attended the Art Center College of Design in Pasadena. One of his first projects was the R.E.M. Losing My Religion video, which won MTV's Best Video of the Year award in 1991. Later he also directed a dream-like video for the song Sweet Lullaby by the French-Belgian new age group Deep Forest. He cast his four-year old niece in the video as she rides a tricycle and travels through eight countries. The travels with a little girl became the inspiration for The Fall. Tarsem's commercial work has included ads for Coke and the now classic piece for Nike. He was recently in Beijing [Images] shooting another Nike commercial which will air during the Olympics [Images]. The work keeps him extremely busy. By his own count he shoots 300 days of the year. "Most people do music videos, so they can do commercials and most people do commercials so they can do movies," he says. "I liked the music videos when I was making them. But once the music stopped appealing to me, I moved to commercials, which I enjoy. I get to check out all the new toys and it keeps me young and telling stories in about a minute." "I just love filming and being on a set," he adds. "I know I will make some more Hollywood films. But in the meantime I am very happy doing what I am doing."